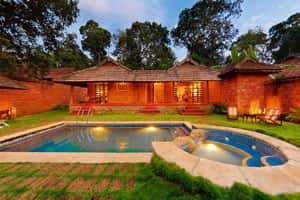 Weekend getaway: Orange County’s Private Pool Villa in Coorg. The firm is also looking to expand in Vietnam and the Maldives. New Delhi: Bangalore-based Orange County Resorts and Hotels Ltd that currently owns two holiday resorts in Coorg and Kabini and manages another in Hassan, Karnataka, is in discussions with New York-based investment firm Trikona Capital Ltd, private equity (PE) firm ICICI Venture, and a few others to sell up to a 20% stake for around Rs60-70 crore. This money will part-fund the Rs220 crore the firm plans to invest in upgrading existing properties and opening four more resorts in the next three years. Orange County is also looking to expand to locations in Vietnam and the Maldives. “We expect our valuation to go up to Rs1,000 crore by 2012. We want a strong investment partner that will not onlybring in expertise in finance, marketing and operational management, thus giving that value-addition to our brand, but also invest with us in our future and overseas expansion," said Abe T. Ramapuram, vice-chairman and director (finance) at Orange County in a phone interview from Bangalore on Wednesday. He added that an investor would be identified within the next two months. Ramapuram said that the company has already acquired land for its four new Indian resorts that will open for business by 2011. Aashish Kalra, co-founder and managing director of Trikona Capital, said his company does not comment on future business initiatives. “We have, however, said we will invest $10 billion (Rs46,300 crore) in India over 10 years in real estate and infrastructure," he added. An ICICI Venture spokesperson declined to comment. The Indian hospitality business has grown 25-30% annually in revenues over the past three years on the back of an expanding economy that encouraged more business travel and put more money in the hands of domestic consumers. The concept of short weekend breaks has gained popularity. Almost all of Orange County’s existing resorts are located within driving distance from Bangalore, India’s information technology hub. An expert said that after infrastructure, PE firms would likely prefer to invest in any area that involves consumer spending. “It is the right time for a one-two resort company like Orange County to bring in financial partners because they have been around for long, have well received properties, and will be able to replicate their model anywhere," said Arun Natarajan, chief executive officer of Venture Intelligence, a research firm focused on PE and venture capital activity. Orange County, which is privately held, claims its valuation is around Rs300-350 crore. The company is part of the Ramapuram group, promoted by a family of seven brothers that also owns coffee and rubber plantations in Karnataka spanning 2,000 acres and valued at more than Rs200 crore.